A man, convinced that the world is actually flat, falls in love with a two-dimensional woman at the Museum of Modern Art in New York. 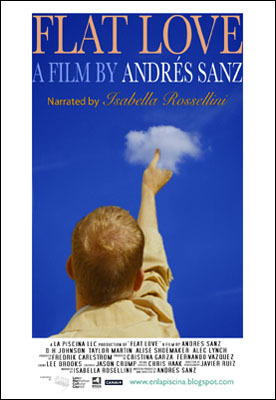 Synopsis: When it seems like every feature is now being released in 3-D, Spanish writer/director Andres Sanz has come up with a witty rebuke. His Manhattan art word-set 15-minute short 'Flat Love' is all about the allure of two-dimensions. A man starts to disbelieve in the third dimension and falls in love with a picture at the Museum of Modern Art in New York. A stylish and surreal love story results, aided and abetted by Isabella Rossellini’s contribution as the film’s narrator.